We recently learned about writer Katy Elliot when she guest blogged on the New England Home Magazine's blog. A few clicks of the mouse brought us to Katy's own blog where she writes about renovating her Marblehead home and her New England design discoveries. This summer she wrote about a visit she took to the Brahms Mount mill in Hallowell, Maine. Maine has a long textile history dating back to the 1800’s, “when almost every family spun fine yarns from local flax and wool”. In the mid-1800’s textile mills popped up along the Saco, Androscoggin and Kennebec rivers. As I kid I can remember buying fabric with my Mom at the Cascade Woolen Mill outlet in Oakland. The mill was built in the 1880s and closed in the 1990s. Countless other mills in Maine have shared the same fate. Brahms Mount has long captured my attention. Back in 2009 I wrote a short piece about the redesign of their website, the next day I got an e-mail from David Kaufman asking if he could call to thank me. We chatted for a few minutes as he explained he recently purchased the company and was working with the former owners to continue the tradition of creating heirloom quality blankets. I was completely blown away by his enthusiasm. 27-years-ago Claudia Brahms and Noel Mount purchased and renovated two historic buildings overlooking the Kennebec river in Hallowell, Maine. They came in search of open air and a large workspace to “make a mess”. 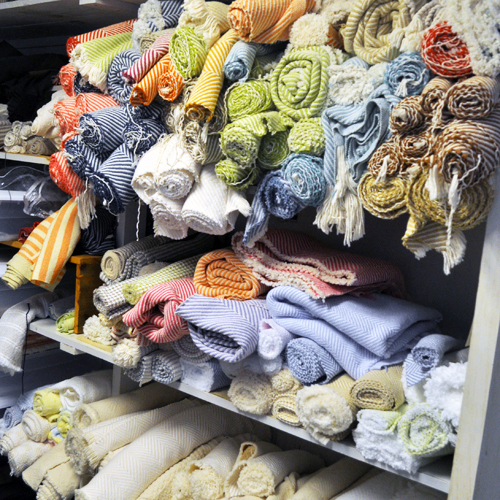 “Antique shuttle looms, the backbone of Maine’s textile tradition, were readily available to equip the mill.” The couple trained artisans and designed a collection of heirloom quality linen and cotton blankets. Since the purchase in 2009, Claudia has continued on as the lead designer and Noel manages the manufacturing aspect of the business. Click here to read more and see her great pictures of the production process. All photos by Katy Elliot. Cozy Brahms Mount blankets are available through Didriks. We provide free shipping for all Brahms Mount blankets anywhere in the contiguous United States. Shop Didriks: Elle Decor's "Trend Alert" & "Daniel's Dish"